I would like to thank all the members of the North Jersey SchH and Police Assoc., for your hard work and also helper Mario Bardouille for a job well done. I am very proud for all the competitors’ results, including my students on passing their BH and IPO titles. 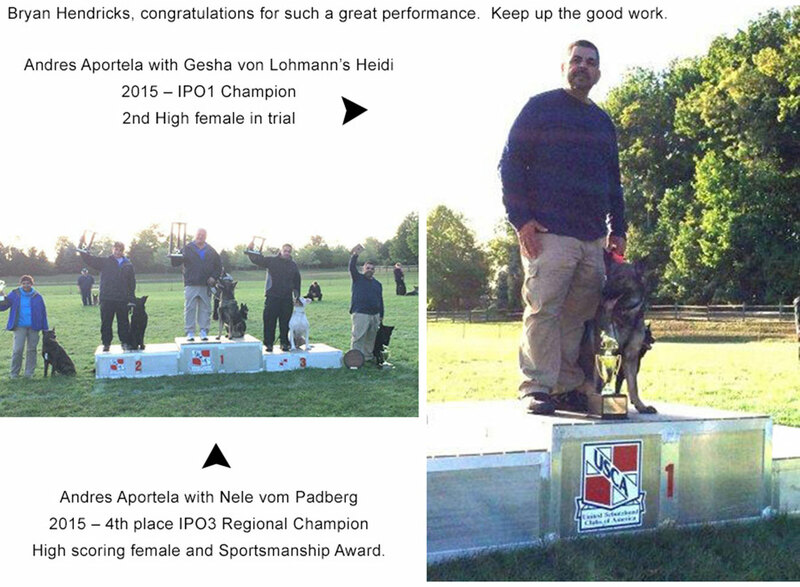 My congratulations to Julianne Walsh with her dog Packo vom Ortenberg competing for BH with a perfect score and top BH, also competed for IPO,1 with a total score of 278, high SG, taking high Protection 98 V.
Congratulations to Hector Nieves with Mento vom Ortenberg competing for IPO,1 with a score of 270 SG, also with his other dogs Windrush Trinity De Nieves Cintron, competing for OB,2 and Pina von Ortenberg competing for BH and Tr1. 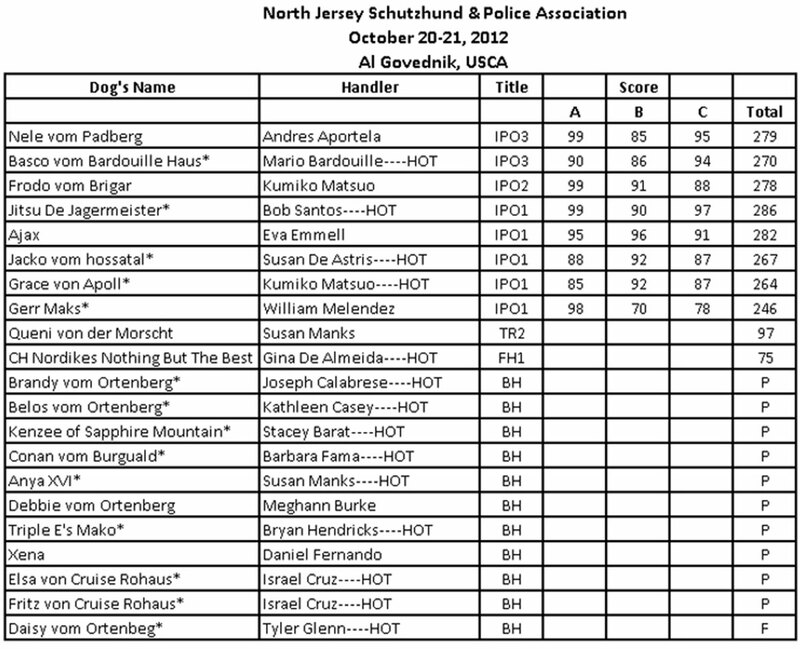 Congratulations to Michele Tipton-Walters with Nina von Apoll on competing for FH,1 with a perfect score of 100 points, also with her other dog Pike vom Ortenberg on competing for BH, OB,1 and Tr1. I would like to thank my mentor, Edgar Kaltenback for sharing his training methods and quality of dogs. Thank you Edgar. 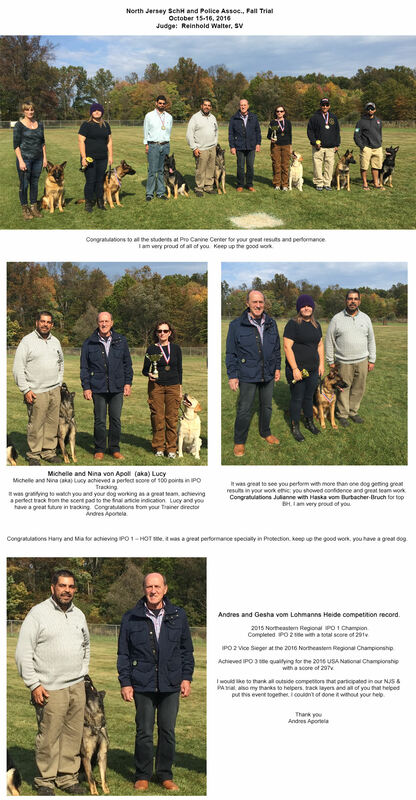 Congratulations to all students and competitors during the October event. We had a total of 17 entries. Best BH routine goes to Tyler Glenn, you did great. Veteran Daniel Mark Wilson and dog team, very good job. We are very proud of you and your dog’s accomplishments. I am glad we helped your dreams come true. Keep up your hard work for future tracking tittles. 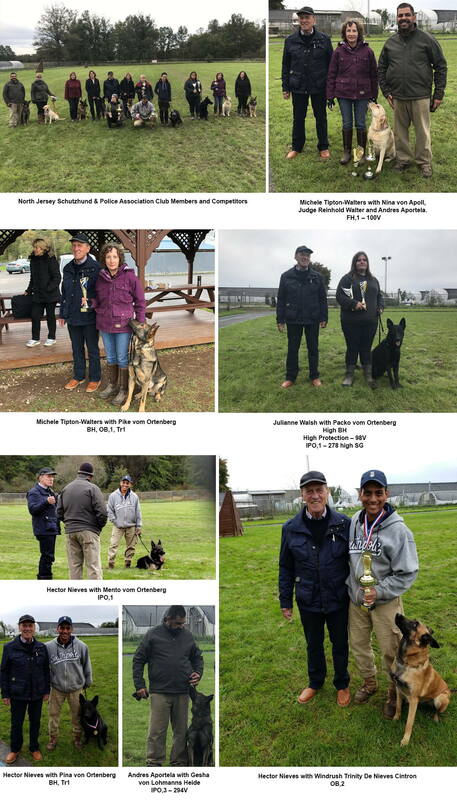 Great job and congratulations to our student Veteran Master Sargent Anthony Carroll and Bast dog team for completing for the Master OB3 title and the Tracking 3 title. Keep up the good work, I’m very proud of you. Best in obedience and 2nd place in IPO1 and 2nd place in trial goes to Patrick Fitzgerald. I take my hat off to you for a great job, you and your dog Falk are going to be a tough team to beat . Best female in trial and high tracking score goes to Susan Andrinopoulos and Madi. It is very nice to see you and your dog accomplish your dream. The picture of you and your dog in the field in all 3 phases was very good I am very proud of you and your little girl she was an eye opener. Keep up the good work. Kathleen Casey with Belos, I am so happy that you and your best body obtain your dream OB1. It was very nice to see a team that works happy and very much together; I am thrilled with the results, keep up the good work. Kumiko Matzuo, the Queen of obedience. Once again you have proof to me and all those who see you in action that you can master all 3 competitive phases including the helper work. You are an example of what a master trainer should be. Great job to Brian Hendricks with the two BH titles, that is a great accomplishment. Without Brian there will be no trial, I am so proud of you not only in the helper work but also as a trainer. 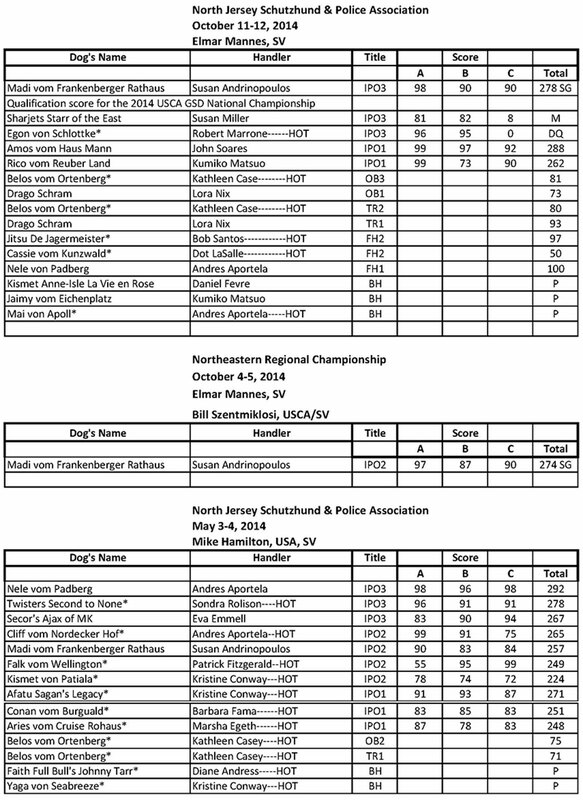 Best of luck to you and your dog in the 2014 National events. Israel Cruz, great work and congratulations on your IPO2, your OB1 and TR1 great work keep up the good work. Bob Santos, from the very beginning you have showed me and demonstrated the most interest in my training program. Your dogs working results say it all, what a great tracking performance you can almost play music against it. You have become a great trainer. Congratulations on your FH1 with a 98 V score. Debbie Baldwin, your are a key team member, you are our right hand in the club and a great friend, thank you for keeping our logistics in check. Joseph Moldovan our visiting competitor, great job for high in IPO1, high in protection and high HOT. Congratulations. I would also like to thank my staff Dawn Ventrillo for her support and managing the entry process.